Sunday was a busy day. I had to overview a client photo shoot which my agency was doing for a recently launched international bank in India. We shot across 3 locations and the first shot was to be captured at PDP Gardens. It was about 9 in the morning when the photographer gave the models a green signal to walk up to the location for the shot. Just then God decided to open up his arms and shower us with some very very unseasonal rains. I think for about 30 minutes all of us were in a soup, wondering what would happen of the shoot, if it did pour a full shower. I mean imagine what would we tell our offices on Monday morning – we cancelled because of rains in the month of April in Mumbai. Anyways, all settled down real quick and we managed to do a good job that day. Not wanting to miss out on some outdoor photography, I clicked some snaps too which I share at my flickr, as always. 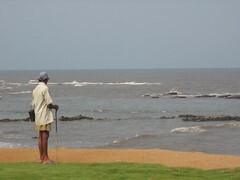 Don’t you think this is an interesting photograph of that old man looking deep into the vastness of the sea.